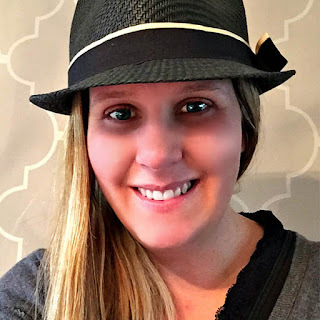 One of the things I love so much about hosting the Summer Home Tour Series is the chance I have to associate with other bloggers. Every one of them are so talented and have such an enthusiasm for what they do, that it is contagious! I have loved getting to know each of them!! No different than any other, I'm super excited to share my next guest's home with you today, you might even recognize her from our furniture refresh group! Please welcome Sue! and what a suitable name for her sweet blog too! Let's say hello, shall we?! 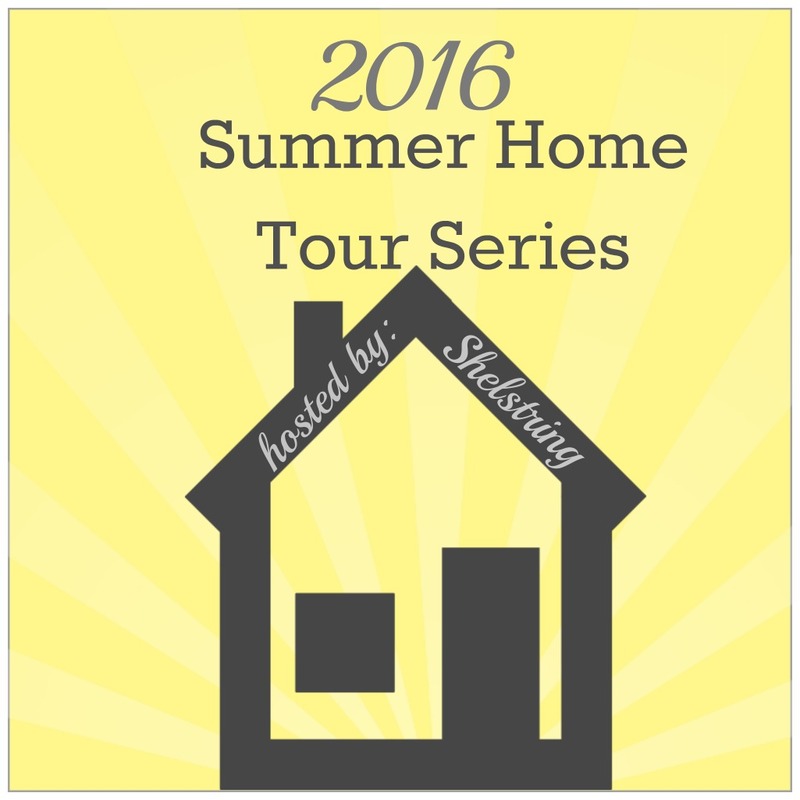 I'm so pleased to be participating in the Summer Home Tour series this year, hosted by the lovely Michele from Shelstring Blog. Welcome to my home :) My entryway sets the stage for the cream and grey colour scheme that can be seen throughout the entire space. I love those colours together, as they are modern and fresh. As we head into my living room, you see I added some summery touches with my decor, such as the boxwood balls, and faux pink flowers. I'm not a flower snob, and I have no issue with using faux flowers in my decor. I can't really seem to keep anything alive anyhow, so these are great for me. Lol. My barcart is typically decorated for the season, and I love using bright fun colours during the summer months. Right off the formal living room is the dining room. I love the soft elegant feel of this room, and my favorite part is the wallpaper. For the summer, I added some faux purple hydrangeas in mason jars in my vintage toolbox I built earlier this year. Off the dining room is the kitchen, done in cream and grey of course. For the summer months, I swapped out my chalkboard menu for a pretty watercolor painting on canvas of some bright flip flops. Speaking of summer cheerfulness.... this cute saying on my counter top used to be the front of greeting a card that was sent for our anniversary, by my sweet aunt who lives in California. I loved it so much that I framed it, and now I get to see it everyday. Before we move outside, let's take a jaunt upstairs to check out the master bedroom. I like to keep things bright and airy in my master bedroom, and add touches of colour depending on the season. This pretty duvet was ordered for my youngest daughter's room for her upcoming makeover, but I loved the colours so much, I commandeered it for a bit. I also made her pillow sham an accent pillow. This cool tropical leaf is my favorite new addition, and I love how dramatic it is. Right off the back door is a deck for lounging. Now, let's take our tour further outside and check out the newest addition. Is it weird that I kind of feel like it's my baby? Lol. Only because this pool, with all its demolition, landscaping, sodding and fence building has been so much work.. a labor of love if you will. But we love it, and wouldn't change a thing if we had to do it all over again. My favorite feature is the waterfall...hands down. We still have some mulching to do, but this is the general gist of it. This comfy seating area allows for a view of the whole pool, so watching the kiddos is easy. WOW!! What's not to love, right?! I am so in love with how Sue adds so many bright touches in her home for the summer! Her yard is amazing, and I have to say, that even though it's all so amazing, my favorite is also the waterfall. I know how much work has been invested with all the time I've been spending on my own yard and it's easy to see that it has been worth all the effort. What a pay-off, right?! 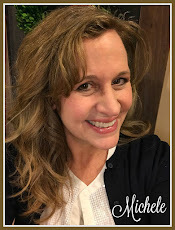 Please visit A Purdy Little House and enjoy all the amazing projects Sue has to share! Thank you for joining me today on this beautiful home tour, and join me next week for a tour with The Garden Chick. Tomorrow I'll be sharing a garden project with you!